I sometimes see people worrying about temperature or pressure readings they see on their TPMS monitor. Based on the reported numbers, I have never been concerned with the minor variation but I felt I needed data to see if my opinion was justified. which have been checked and found accurate to +/-0.5 psi against ISO laboratory certified pressure gauges, I also have two TPMS on my RV. I am probably the only individual in the US and possibly the world to have an RV so equipped. 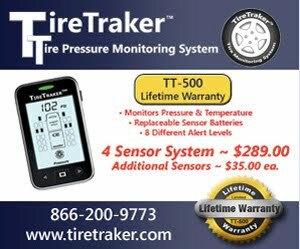 The reason for having two systems is so I can give you this test report as I have relatively high confidence that with my frequent inflation checks with my digital gauges and adjustments to inflation I feel I would identify any problems with my TPMS. More on that later. I installed my internal TPM about two weeks after buying my RV in 2008. At the time I was quite familiar with internal systems as I had been spending a significant portion of my work time involved with the OE versions of TPMS sensors. Some like this one had been damaged by improper mounting practice. 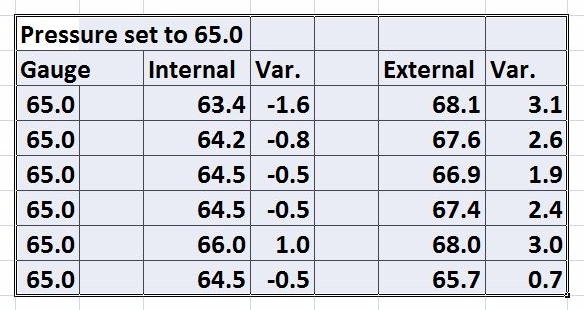 My internal system is actually a car based system as it has an upper pressure range of 75psi but since I set my tires to 65 psi which is about 10psi above the minimum needed based on actual tire load, I felt I would not be seeing a big rise in inflation pressure. I was of course more concerned with the potential of a puncture and loss of air pressure. I subsequently learned that I would occasionally get a "high press" warning on one or two tires but have confirmed that my tires only get up to about 77 psi max. I started this blog in 2011. After that I also increased my reading of various RV forums where I started to see more and more comments and questions on TPMS accuracy, I decided I needed to do some testing. Here are the results from a number of tests. As you can see that while there is measurable difference in the readings I do not consider these meaningful and would consider the +/- 3 psi acceptible as I consider a TPM to really be a warning system based on a change in pressure and not a substitute for an accurate pressure gauge. Running pressure shows a simmilar range of variation as seen above. 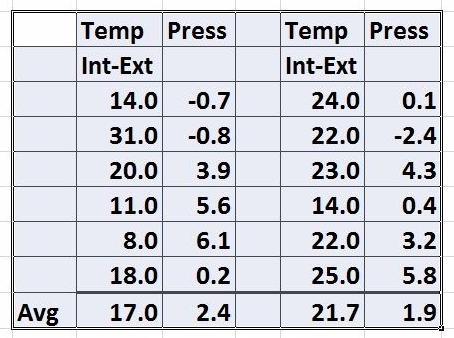 Running temperature is a slightly different story.Since each tire has a slightly different load and there is a significant difference in air-flow around the fronts vs the dual rears as well as a difference between the inner and outer dual, I would expect more variation and we see this in the test results shown here. I note that the internal temperature is consistently higher than the external temperature reading which is to be expected with the external sensor both further from the heat source and being cooled by the external air flowing over both the sensor and in the rears over my extender hoses. I previously mentioned that I felt I would be able to see a failing TPM sensor and I can report that I was able to discover a leak of about 8 psi a month because I pay attention to the range of readings of my TPMS. I do not write down the numbers every time but I do pay attention to the range of numbers observed. I can also confirm that my external system gave me a warning as it is set tighter than the internal system. The leak was at the TPM sensor itself but since my system has a three year warranty I have been able to get a free replacement sensor. You can expect some variation in both pressure and temperature between different TPM systems. If you use a good hand gauge to set your pressures and just make a mental note of the range of pressure readings right after setting the tire pressures and on your first couple of trips, I think you will be able to recognize when there is a leak or an unusual reading that warrants additional investigation.